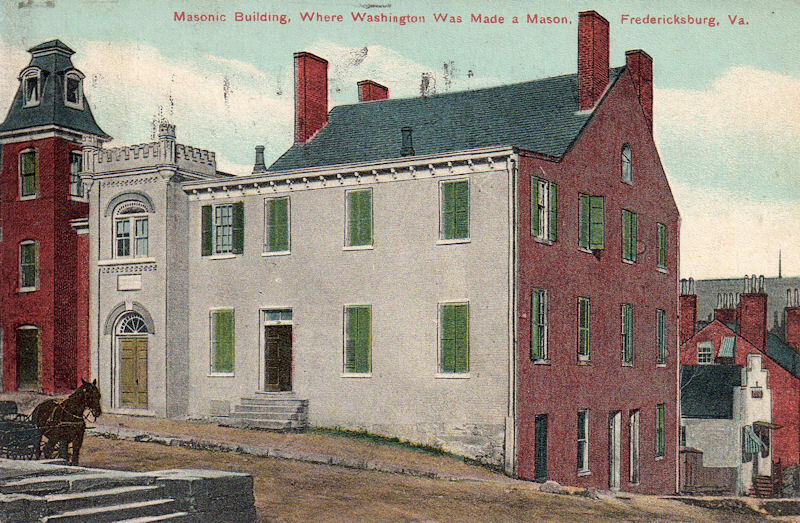 Fredericksburg Lodge No. 4 and Kilwinning Crosse Lodge No. 2-237 have an inherently intertwined history that begins prior to the formation of a formal lodge in either locality and persists to the present day. On April 12, 1754, the first recorded meeting took place in Port Royal Cross (note the different spelling between ‘Crosse’ vs ‘Cross’) with 12 brethren and 2 visitors. One such visitor was Thomas Landrum who had been a regular attendee at the lodge in Fredericksburg*, presently Fredericksburg Lodge No. 41. At this meeting, the brethren at Port Royal committed to petitioning the Grand Lodge of Scotland to provide for the better regulation and governance of the brethren that a charter allowed. As the years progressed, and following the official chartering of Fredericksburg Lodge No. 4 which had been under labor for quite some time, both sister lodges would enjoy similar freedoms, duties, and experiences. Both lodges would warrant labor of daughter lodges, Botetourt Lodge by Fredericksburg in 1770 and Tappahannock Hobbs’ Hole Lodge by Kilwinning Crosse in 1756, shortly after receiving their charter from the long voyage across the Atlantic2. When it came time to form a Grand Lodge of Virginia, both Scottish lodges participated in the proceedings and were represented within the ranks of the Grand Lodge officers. Many brethren share current ties between the two lodges due to their historical prominence and proximity. One such brother was General George Weedon who would later play a crucial role in the Revolutionary War as discussed in on our Famous Brethren page. Worshipful George Weedon was made a Mason in Kilwinning Crosse on May 3, 1757 and would later request to permanently change his membership to Fredericksburg lodge in February 1767. Shortly thereafter, Weedon would be elected Master of the lodge in Fredericksburg where his portrait still hangs to this day. Brother Weedon’s joint relationship between the two lodges would prove beneficial on December 28th of 1767 when the brethren of Kilwinning Crosse sent two brothers “to our Sister Lodge of Fredericksburg, intimating that our Lodge was convened and would be glad to join them.” (excerpt from December 28, 1767 minutes) The two lodges joined together for a church service and later adjourned to Brother Weedon’s tavern for refreshment. With regards to their facilities, it is recorded in J.B. Sener’s History of Kilwinning Crosse Lodge that on September 19, 1783, delegations from Alexandria Lodge No. 22 and Kilwinning Port Royal Crosse assisted Fredericskburg Lodge in the ceremony of ‘fixing at the market-house a grand keystone and plate of silver inscribed in testimony of the revival of Masonry and our intention to fix our covenant there.’ General Weedon served as the master of ceremonies. 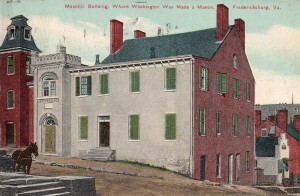 Kilwinning Port Royal Crosse later solicited from assistance in building a facility of their own from Fredericksburg, Tappahannock, and Falmouth, though that lodge building was never completed. It is also refreshing to note that a strong tie of friendship, brotherly love, and charity has often been extended to our friends and brothers in Fredericksburg. In 1807, a fire began at the corner of Princess Anne and Lewis streets and burned most of the downtown region. News of the fire traveled fast and $7000 was raised for the rebuilding effort3. Kilwinning Crosse personally donated $100 to the rebuilding effort, an amount worth approximately $61,000 when converted to modern-day commodity costs2. Throughout much of the mid-19th century, Port Royal and Caroline County was ravaged by civil unrest, war, and economic sprawl towards the more urban centers. Much of the business in Caroline traveled to Richmond where more lucrative deals could be had and the Civil War saw a reduction in the use of docks in Port Royal. The men in Kilwinning Crosse were called away or off to war. Interactions between the lodges largely ceased until 1881 when Kilwinning Crosse was chartered under their current Charter with Robert Peatross as Worshipful Master. Peatross was a former Confederate Major who had commanded the 30th Virginia Infantry composed of men hailing from Fredericksburg, Spotsylvania, Caroline, Stafford, and King George. In this capacity, he undoubtedly served with brothers from Fredericksburg lodge. Right Worshipful Peatross would again bring Kilwinning Crosse and Fredericksburg together when he was appointed District Deputy Grand Master of the newly formed, and present day, District 8 within the Grand Lodge of Virginia. In this capacity, he returned Kilwinning Crosse to regular and well-governed labor. It took nearly 4 decades, but both sister lodges were finally reunited in a common jurisdiction. Today, Fredericksburg and Kilwinning Crosse remain a part of each other’s labor, participating in charity events, such as blood drives, and conducting fraternal visits. Many brothers share dual membership between the two bodies and participate in appendant organizations together. 1) Hillman, James Noah. Kilwinning Crosse Lodge Number 2-237, A.F. & A.M., the Second Oldest Chartered Lodge in the Commonwealth of Virginia. Richmond, Virginia: Grand Lodge of Virginia, 1955. 2) Wingfield, Marshall, and Edward Maria Wingfield. A History of Caroline County, Virginia: From Its Formation in 1727 to 1924. Richmond, Virginia: Trevvet Christian, 1924. 3) Jacobs, Melissa. “The Day Fredericksburg Burned.” The Free Lance-Star, October 19, 1990, Area/State sec. †Information provided by Shelby Chandler, District Education Officer for the 8th Masonic District, Virginia, in an e-mail sent to Wor. Joseph Pack, Kilwinning Crosse, on April 3, 2015.